Erie County, in partnership with the Western NY Storm water Coalition, the City of Buffalo, and the Town of Wheatfield, is once again offering rain barrels and compost bins at wholesale prices. Order yours today. This offer ends May 3rd, 2019. There are 2 locations to pick up orders: City of Buffalo Engineering Garage and Town of Wheatfield Town Hall. THE SPECIFIC DATE/TIME AND LOCATION FOR PICK UP WILL BE SELECTED BY THE PURCHASER WHEN CHECKING OUT. You must pick up your order at the location, date and time that you select at checkout or have someone pick it up for you. Orders are not available for pick up at these locations outside of the dates/times listed at check out. 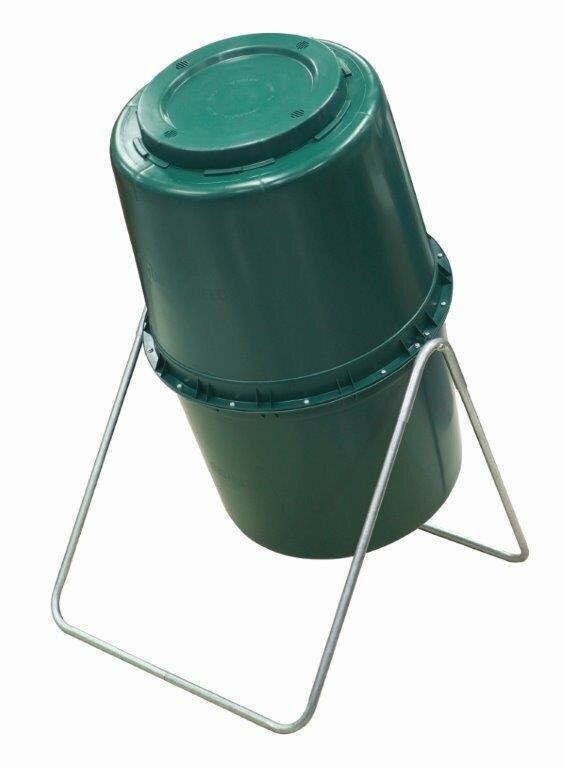 Compost tumbler made from 100% UV protected green recycled material. Dimensions: 33 ½” x 33” x 45”h (fully assembled) with a capacity of 58 gallons/7.75 cubic feet. Easy to assemble (2 halves, frame), spins vertically to maximize compost production and features an internal stainless steel central breaker bar that mixes and aerates to speed decomposition. Sturdy galvanized steel frame/legs to stand on any surface. Weight: 30 lbs empty, and comes with a 1 year limited warranty against manufacturer defects. There are several environmental benefits associated with rain barrels. Foremost, rain barrels reduce storm water runoff - this is water that does not soak in to the ground and can transport many pollutants directly to our local waterways untreated. By using harvested rainwater for watering lawns, gardens, potted plants and for washing off patio furniture and tools,rain barrels conserve water. From a gardening perspective, the natural nutrients in rainwater make it far better than tap water, which has chlorine and fluoride in it. With a rain barrel, gardeners can minimize or eliminate their use of chemical fertilizers. Composting yard trimmings and food waste is a simple way to recycle nutrients and return them to the soil. The addition of compost enriches soil and will stimulate plant growth, thereby reducing the need for chemical fertilizers. Composting has the added benefit of reducing the amount of solid waste that would otherwise go to a landfill.